Dana Point Real Estate News: Holiday Events and Activities !!! Posted by Teresa Mihelic HelpDesk on Friday, November 18th, 2011 at 1:16pm. Dana Point Real Estate News: Holiday Events! Well, technically this is not Dana Point real estate related information, but knowing about the events happening in the city that you might want to purchase a home in, is obviously important, so we wanted to share the dates and locations for some of our favorite events happening in Dana Point this 2011 Holiday Season. Best part, most of these events are free or require little money to enjoy! Sunday November 20th: Holiday Tree Lighting Ceremony at the Ritz Carlton. This a beautiful event with the annual Tree Lighting and the opening of the Fourth Annual Holiday Surfboard Auction. The event includes festive holiday music and a visit by Santa Claus. They will also have The Holiday Gingerbread Display.From 4 to 7pm. Thursday November 24th: Turkey Trot!! "Enjoy pounding surf, rugged cliffs, and cool ocean breezes as you sail through the Dana Point Marina, Doheny State Park and pass the historic tallship Pilgrim moored in Dana Point Harbor"
Santa will hear your Christmas wishes and is available for photos ( you can take your own at no cost). There are many fun activities performances by various characters, holiday crafts, people painting, and a puppet show. So, bring friends and family down to enjoy the Harbor’s Holiday spirit.The parking and events are FREE! From 4pm to 8pm. December 3 - 4th: Boat Rides with Santa From 10am-2pm. Free pictures with Santa. Great opportunity to have the kids tell Santa if they have been naughty or nice! This will be hosted around the El Torito courtyard on Dec 8th and the Dana Wharf on Dec 15th. This a gorgeous event where boaters from all Orange County compete on decorating their boats and then do a parade. It can be seen from pretty much anywhere around the Dana Point Harbor, and people often like to make reservations for dinner in the Harbor restaurants. Dress warm if you are going to be outside. 7:30pm by the Water's Edge. The City of Dana Pointfeatures this event at La Plaza Park, including cookie decorating Cookie Decorating, Santa’s Reindeer, Holiday Craft Fair, Carnival Games, Children’s Petting Zoo, Tree Lighting Ceremony and Holiday Movie in the park. There's even a real Snow Play Area!!! From 12pm to 7pm. For more information about these events, please visit the Dana Point city website, and for more information on homes in Dana Point, please visit our page for Dana Point Real Estate. 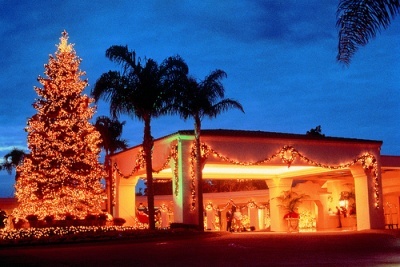 1 Response to "Dana Point Real Estate News: Holiday Events and Activities !!!" CJ Kovar :0) wrote: Sylvie, I love your site. Very PROUD OF YOU !!!!!!!!!!!!!! Posted on Saturday, November 19th, 2011 at 8:06am.